So I have been running a number of AdWords campaigns for a couple of clients who are smaller players in big, ugly, noisy, and fiercely competitive categories filled with companies who are high rollers in the Paid Search arena. My clients need to be running Paid Search campaigns. It’s the perfect channel for them. But there is no way they can come close to anteing up the dough required to occupy a #1 position in AdWords and still get anything resembling a decent ROAS. So, as you might guess, my goal has been to simply hang out in the 2.5 to 3.5 Average Position range. In fact, that’s my sweet spot and has worked quite well. As long as my CTRs are decent, my volume is acceptable, and my Cost Per Conversions are solid, I’m fine with being #2. Or #3. Or even #4 or #5. Naturally, the Average Position metric has become a close friend of mine. But something else has, too: the Top vs. Other report. Top vs. Other. What is it? The Top Vs. Other segment in AdWords gives you performance data based on where your ad appeared on the search engine results. So you can see how your ad performed when it was at the TOP of the page — meaning that it appeared before all the non-paid, organic listings vs. “Other” — which, in this case (Google Search Network), would be at the bottom, after all the organic results. And the good news is you can view this breakdown at the campaign, ad group, and/or keyword level. Top vs. Other. Where is it? To segment your data with Top vs. Other simply go to the Segment Dropdown in your current view (campaign, ad group, or keyword) and select Top vs. Other. If you’re using the newer AdWords interface, you’ll access it by clicking the “dashed circle” icon over on the right side of your dashboard (see screen cap). I must warn you: the first time you segment your data with Top vs. Other you’ll be in for a shock. You’ll immediately notice that, more often than not, when your ad topples from top of the page to the bottom, that your CTR, conversions and pretty much every other metric goes along with it. Here’s a Top vs. Other of one of my recent campaigns. Yikes. Love the CPC but it’s killing my CTR and conversions are nowhere to be found. So I need to at least be aware of this when adjusting bids. I have a high relevance scores in this campaign. And my impression share is pretty high. So upping the bid to avoid that deadly drop is something that is now on my to-do list. But what I’m really looking at here is something I call “Position Elasticity.” Can a particular campaign thrive/survive at the bottom of the page or do I need to do everything in my power to keep it up top? Here’s another campaign I’m running for the same client. Okay, not bad. At least in this one we’re seeing some action at the bottom — with a brutal CTR but much higher conversion rate and lower cost per conversion. So, even with such little data, I’m a little less concerned about the Position Elasticity of this campaign than I am about the first one. I can probably leave this be, and it will do just fine. But I’m going to drill down to the ad group level in this campaign and segment with Top vs. Other to see what else I can learn. Ah, very interesting. I see one ad group that is very elastic. Not enough data to make any assumptions with any confidence, but I see that this particular ad group might be a player even at at 5.5 Average position. And you can keep going. Here’s a keyword from the ad group above with Top vs. Other segmentation applied. Like so many things in AdWords, this process could easily become a full-time job if you let it. But the takeaway here is: the Top vs. Other segment can further help you understand what’s really going on with your ads when they’re out there frolicking in the wild. And if you’re in a noisy category where snagging the #1 position doesn’t make any business sense, Top vs. Other can be a huge asset. Just keep in mind that you’re generally going to take a performance hit when you’re at the bottom of the page. 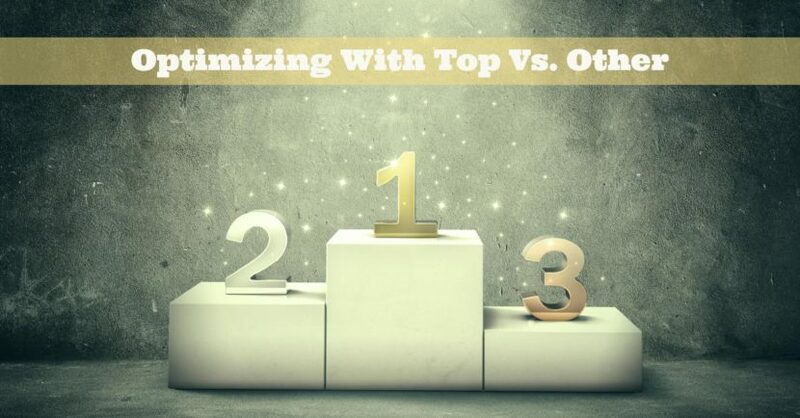 So don’t freak out (like I did) the first time you use Top vs. Other. As always, I hope you found this quick tour of Top vs. Other helpful. If I got anything wrong or you have something to add, let me know in the comments section.